Teagan's family has always been fairly normal...until her estranged cousin Finn comes to live with them, claiming to have knowledge of goblins and talking about them as if they exist outside her mother’s stories. Teagan shrugs off his words, but then her little brother Aiden claims to have seen a shadowy figure harm their mother, and she falls into a coma and dies not long afterwards. Soon, Teagen begins to see these goblins as well, and learns that they are after her family for reasons she can't understand, and that Finn is Finn Mac Cumhail, the legendary hero who will defeat the goblins. And it's not long before Teagan's mother's tales come violently, vibrantly to life. 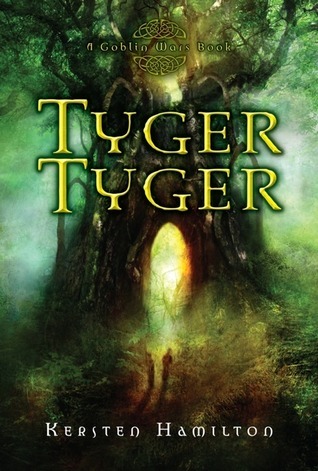 Tyger Tyger is a very imaginative novel that cleverly and seamlessly incorporates many Irish myths and legends into the story. There is a fine balance of terrifying and entertaining elements in this book; Teagan's mother's death is tragic, and it makes the goblins' existence more realistic and menacing, yet there are many amusing moments between Teagan, Aiden and Finn as they are on the run. Finn especially is a smart and tough character, is charismatic without having to try, and it is obvious from the very beginning that he genuinely cares about Teagan and Aiden. Aiden is a very cute character, and it's great to see a younger sibling play such a positive role in a YA novel. Though he is obstinate and frustrating at times, he is a sweet and endearing character, and very important to the story. Though there is a touch of romance to Tyger Tyger, the focus is on building the goblin world and Teagan and Aiden's discovery of it, and who they really are. Hamilton throws in a fascinating twist that changes everything, and leaves the ending open and everyone content...for now. It will be quite interesting to see where Hamilton will take the characters in book two of this planned trilogy, and hopefully there will be more colorful characters with their fascinating and varying backgrounds steeped in Irish lore. Cover Comments: I am not a fan of this cover at all...it's dark and fuzzy and it looks like something that would belong on an obscure kids' fantasy book, not a YA novel. Tyger Tyger will be available on November 15th, 2010! And now, here is an interview with author Kersten Hamilton! TCR: I loved all of the Irish myths and stories that are so seamlessly woven into Tyger Tyger. Was it hard to incorporate them all into the novel, and what sort of research did you have to do regarding them? Kersten: The tricky part was weaving myth, legend, history and science together into a world that felt real…and doing it without slowing the story down. I did a lot of reading to find the myths and legends that fit the story I was telling—and sometimes the myths and legends where just so good that I changed the story to fit them! TCR: What was the hardest part about writing Tyger Tyger? The easiest? Kersten: Oh, let’s start with the easiest! That would be dreaming up characters and story. I love that part. The hardest part for me is copy edits. The tiny little nit–picky details that must be attended to after I already know the whole story by heart. I’ve already read it One. Million. Times. Getting through final edits (while new, shiny stories are waiting to be told!) takes real discipline for me. TCR: One strong element of Tyger Tyger is the characters' love of stories; was that something that you deliberately wrote in, or found its way in by itself? Kersten: The love of story springs from my own life. For a large part of my childhood we lived in houses with no electricity. Even when we lived in town, we rarely had access to a television. What we did have, at least while I was small, was a dad who told stories. Not the short stories you might hear at a storytelling festival. He told novel length stories, spinning them out of nothingness every night for days or weeks on end. He was very well read and loved history. He told western stories about cowboys, and stories of set on sailing ships. I still remember listening to space sagas outside under the desert stars. But before I was a teenager, my dad developed a brain tumor. We had to tell our own stories after that, or find them in books. TCR: Have you always been interested in Irish myths? Can you recommend any resources to readers who might be interested in learning more? Kersten: I was born interested in all things Celtic. My own roots are Welsh, and the stories and songs of the Celts move me like no other music or body of literature. I can feel them in the marrow of my bones. Two of the books I have I have found useful are: Alexander Carmichael’s Carmina Gadelica: Hymns & Incantations, and James Macpherson’s The Poems of Ossian and Related Works. MacPherson mixes things up a bit, but it’s all in good fun. George MacDonald’s fairytales are excellent, too. TCR: Can you tell us anything about the next Goblin Wars book? Kersten: I can tell you that it is darker, more intense…and I’m loving every bit of it. Which means it’s not to the copy edits yet. And now, to bide the time until Tyger Tyger is released, I'm offering a Tyger Tyger bookmark, plus other assorted swag from collection, to five lucky winners! All you have to do to enter is leave a comment below! The contest will close on August 15th, 2010. 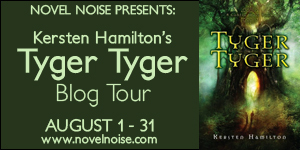 Also, if you want to learn more about Kersten and Tyger Tyger, visit kerstenhamilton.com, or follow the rest of her blog tour by clicking here! Many thanks to Novel Noise for putting this tour together! Tyger Tyger sounds like a really interesting book. I love the cover! Superb review! I really like the cover and the Irish myths sound appealing! This book sounds so awesome! I love the fact that Irish myth is involved. Can't wait to get my hands on a copy. Cassandra and Kate—I like the cover, too. A lot of people on the net have commented that Tyger Tyger is very different from most YA. Different but good. I think my cover reflects that. Tina: I'm glad you are excited about Tyger Tyger! I'm having a hard time waiting until its out and EVERYBODY can read it. I'm filling up my time writing book two. I'm Welsh, too, and Wales is a gorgeous, spectacular country so I can't wait to read this book! Great interview! Oh, I just posted by Tyger Tyger review today. Cool book. Celtic Mythology! Being a Scottish lass myself and a fan of the late, great George MacDonald, I'm eager to read the book, Kersten. Melina-I stopped by your blog. VERY impressive! I just read this book through NetGalley and I loved it! Specially de Irish mythology. I'd recomment it to any Ya lover out there. Thank you for the interview and contest! This one is at the top of my "to read" list. It will be my treat to myself for Thanksgiving weekend, after the Turkey is cooked. Maybe before. Carolee— I'm going to have my Thanksgiving celebration in September, when book two is sent in! You might want to read tho because it's important. I own the advanced reading copy of your book "Tyger Tyger" I don't know when it will be released for sale but I did find some spelling errors in your book that you might want to know about. On page 237 at the end of the page you spelled "farther" like "farthur"
And towards the begining at the end of one of the Ben numbered pages (I can't remember which one) you forgot to add a quotation mark after a character spoke. Just thought you'd like to know about these, and I really like your book!!! You might want to read this because it's important. I own the advanced reading copy of your book "Tyger Tyger" I don't know when it will be released for sale but I did find some spelling errors in your book that you might want to know about. And towards the begining at the end of one of the even numbered pages (I can't remember which one) you forgot to add a quotation mark after a character spoke. Advance copies do tend to have errors in spelling, punctuation, and format. They're like a final draft for the book, and all of those mistakes will be taken care of in the finished copy. I will make a note of them, and check in the finished book. If they have slipped through, (it does happen once in a while!) we will fix them before it is re-printed. I'm glad you liked Tyger Tyger! I can't wait to read Tyger Tyger! It sounds so good!!! I'm eager to read the book in Nov. Sounds like an intriguing story with lots of depth. I loved this book as well, so captivating and different. I did like the cover though, I thought it looked like a beautiful painting her mom would do, so I thought it fit.